Confidence can be hard to come by. Especially if you need it in the face of a time and culture that seems to be pressing in and rejecting your most deeply held values and beliefs. Timothy was a man given a specific mission and faced circumstances that began to shake his confidence and courage. Through the letters of Timothy’s mentor the Apostle Paul we can listen to the intimate message of encouragement and challenge given to a young man with a significant responsibility. Join Pastor Philip De Courcy as he teaches the powerful truths that the Apostle Paul taught Timothy to give him courage and confidence to carry out the mission God had set before him. 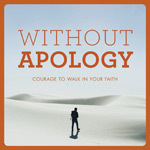 Pastor Philip’s series Without Apology will both encourage and equip you to live your christian life confidently.